The challenges of treating treatment-resistant bacterial infections of the uterine lining in horses have been described by a veterinarian in the latest issue of Equine Disease Quarterly. Bacterial endometritis that is stubborn to traditional antimicrobial treatment is a significant challenge to the equine breeding industry, writes Ryan Ferris, of Oregon-based Summit Equine, which offers reproductive and sports medicine services. A common survival strategy employed by bacterial pathogens is the formation of a biofilm, which is a complex and dynamic structure composed of aggregates of bacteria surrounded by a thick protective layer of exopolysaccharide. Biofilms confer resistance to immune-based clearance by reducing the host’s ability to recognize infection, he says. “Additionally, biofilms protect bacteria from antibiotics by providing a diffusion barrier and creating a microenvironment that slows down bacterial metabolism and replication, which makes them more tolerant to antimicrobial agents. The biofilm forms in multiple locations with the greatest amount of adherent bacteria occurring between the tissue folds and in the uterine horns. This suggests that a traditional guarded culture swab may not be ideal for detecting biofilm-associated infections and a low volume lavage may be a better diagnostic tool, he says. “The bacteria are in greater numbers deep within the endometrial glands as compared to the luminal surface. “To be successful in clearing these infections, treatment options will need to be capable of penetrating deeper into the glands and tissue. Ferris says bacteria residing in a biofilm can be up to 1000 times more resistant to treatment with antibiotics as compared to free-living (planktonic) bacteria. “The simple administration of more or a higher concentration of antibiotics has failed to eliminate chronic biofilm infections in both human and veterinary medicine. Ferris says a series of studies in a laboratory setting were conducted to assess biofilm dispersal and/or bacterial killing by antibiotics and non-antibiotic agents alone or in combination against Gram-negative bacteria (E. coli, K. pneumoniae and P. aeruginosa). The results indicate that antibiotics and non-antibiotic agents are more effective against biofilms if given concurrently. “When dealing with bacterial infections protected in biofilms, the treatment period should be at least 72 hours in duration, with repeated treatments every 24 hours (i.e. a uterine infusion of the selected combination once every 24 hours for three consecutive days). Biofilm formed in a test tube. “Following this treatment protocol, the biofilm was completed disrupted and bacterial killing ensued. 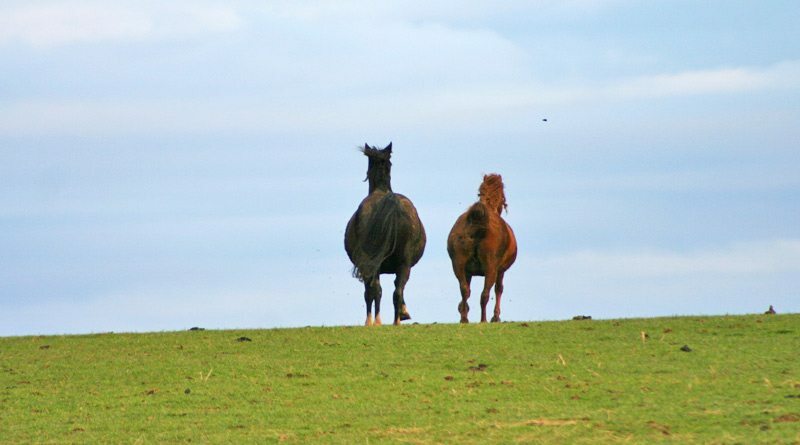 A recent study in horses evaluated the intrauterine treatment of a preformed Pseudomonas aeruginosa biofilm with a combination of ceftiofur and trisEDTA or ceftiofur and tris-EDTA alone. “Of five mares treated with a combination of ceftiofur and tris-EDTA, all effectively cleared the infection. This contrasted with only two of five mares treated with ceftiofur and one of five mares with trisEDTA. Ferris says advances in our understanding of the significance of biofilms in human and veterinary medicine will in time lead to improved diagnostics and more effective treatment modalities.